I should have known. I felt a wee bit of a scratchy throat and the next day I definitely had a sore throat. 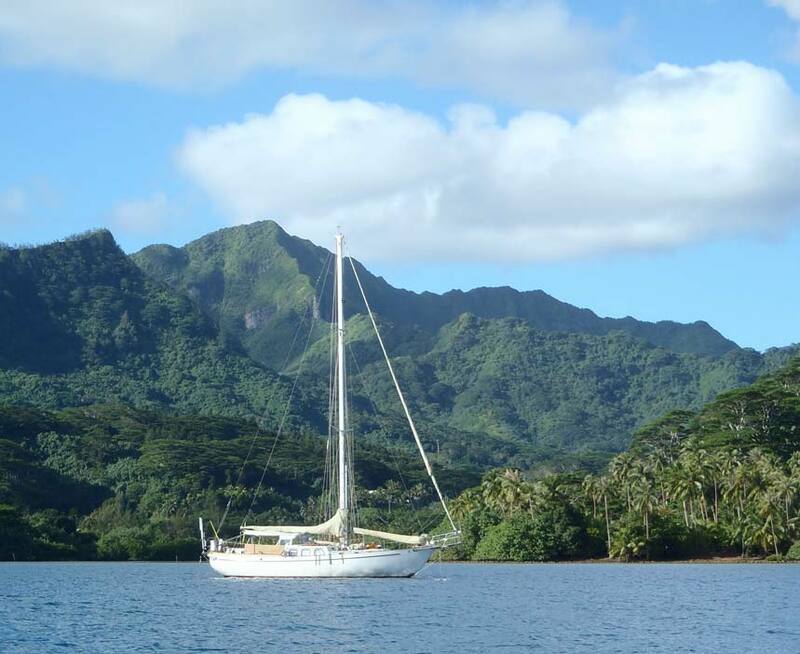 Had we been traveling we would have had no choice but for us to leave for Huahine; a 100 nm trip, with one of us sick was not in our cards. If we had to we could have. But; it was not required. And besides the weather just didn’t look exactly the way we wanted it to look. There was no need to rush, the stars were not aligned right so we didn’t hurry. I needed to get well. I started taking care of the symptoms and the sore throat had eased a bit when W/ commented on the same thing. Now both of us are sick. It is a good thing we are at a safe quiet anchorage with supplies near by. We hang on the boat for an extra day and then both feel well enough for a walk. We walk for food and to the pharmacy to replenish our cold supplies. Two days later we’re ready to go and at noon we up anchor and motor out of the harbor heading NW. The wind is looking good; about 10 kts and the seas are to be about a meter or less. But one thing we don’t really get info on is a cross sea. We cleared the coast of Moorea before nightfall and saw no more whales. We don’t wish to come across any at night as we hear they do sleep and we’ve also known of other boats that run into them. Not a good thing for either the boat (us) or the whale. My guess is – if they do bruise it’s one hell of a bruise having a boat strike it while sleeping and I also have heard of the whales getting rather upset and attacking the boat at times doing some damage. We fly our geriatric sail and settle in for the night. Our watch system has been working well; 3 on 3 off, then 2 on and 2 off. We try to go a little more giving each other time to prepare for sleep and prepare for getting on the deck. So we would ideally like it to be 3 sleeping, then 2 sleeping. We can do further sleep time during the day but if either of us can really get 5 hours at night then we seem to be quite good for doing what is needed the following day. The night goes well and I actually email some of my shore side team bragging that this passage is rather “uneventful”. And again the future makes a liar out of me. The seas are a little confused and the boat is moving in some odd directions, not a lot but enough that neither of us is really comfortable. We gybe in the middle of the night finding we are making to much N in our track and even still the boat’s motion is a little uncomfortable. I describe it like a washing machine set on “delicate”. Still we’re getting shaken up a bit but we are making progress and as the Sun rises we see Huahine. wearing on the luff line on the jib. Nothing is good about that and really, I can’t effect a repair here and only 4 hours away from harbor. We furl it. Luckily it still furls as my fear was that it would not. I was so busy checking out what to do I forgot to get a good look at why the pieces parted. Did the screws back out or did the heads pop off them. Knowing which will effect how we need to repair it. The furled sail ain’t pretty but she is no longer in trouble. 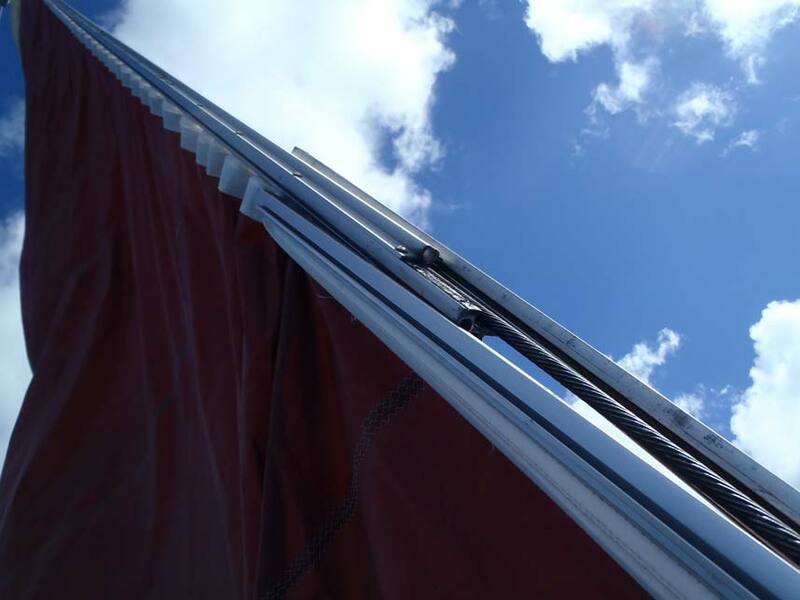 I hoist the staysail jib and we slow down only 1/2 knot and continue on course. In the end this means that we make harbor about 30 minutes later than if we had had no problem. Fortunately we had timed this crossing right and before noon we hope to be anchored. The reef around the SW side of Huahine is sometimes out a mile from shore and with the new moon and tides up we are fascinated by the huge breaking surf; glad to be off enough that it bothers us not. But; the surfers love it and as we clear the pass we watch as they mount the waves and some ride them to a sweet exit while others make a grand tumble up over and into the water. Clear the pass we check out the anchorages. A group of boats are anchored on the reef but we just don’t like doing that and don’t feel comfortable doing that. We instead head up the bay and anchor in the shallow (20 m ) water there. With wind gusting down the mountain we sit for lunch and watch as our boat sails back and forth on the anchor all the while digging it deeper and deeper into the mud. I love sailing on the anchor! The boat is calm and we have a good breeze. The following morning we’ll launch the dinghy, explore the town and the other anchorages. We hope to be here about 7-10 days. But again….we just don’t see the future very well. After 2 nights, maybe 3, we choose to move S a bit. We needed a calm place to fix the sail and of course we were getting a bit tired of the constant gusting out of the mountains. We choose Port Bourayne which was described as closest to a Scottish Highlands as anyplace existing S of the equator. We motored down inside the reef and another problem appeared. The surging of the engine that we had before is back. Damn! But the surging didn’t cause us to change where we were going only that I needed to be aware more of what was around us, have the windlass turned on and be ready with a sail. The surging was pretty regular and indicates an air leak in the fuel system, why again it would surface was any ones guess. Add to my list to contact my mechanical shore side support team. We turned the corner passing into the bay and headed to the NE corner where another catamaran was. As we closed in on it we discovered it was our friends Werner and Kristina on Windance III. Sweet. Maybe we’ll be lucky and they’ll be here a day or so and I can beg his help. And lucky we were; they would be here a couple of days and tomorrow he would assist in fixing of the furler. In the am we expect it to be calmer and we can do it then. But ma nature if anything is not good at consistency, nor does she read weather maps and predictions. In the am we didn’t get the calm we expected but as the breeze was less then 10 kts we decided to go ahead anyway. The plan was: Send me up the mast, unfurl the sail and inspect to see if the screws vibrated loose or the heads popped off. If they were gone it would be a good thing because we could loosen the jib halyard, pull up the track, put the pieces back in place and add new screws with locktite. And that is what we did. Since the track has an internal halyard we had to first loosen the halyard for the reefer and then I used a halyard to pull the track back up in place. However I had forgotten that this system if free floating and as I pulled the upper track up it pulled the lower with it too. Werner was below and once we discovered this he had to pull down the lower section. Finally they were far enough apart that he could fit the two pieces back into place and then add the screws with my favorite; Duralac – a coating that has not failed me yet. However, some of the jib halyard and some of the luff wire of the sail had worked it’s way out of the track so once Werner put the pieces back together he had to gently tap the wire and the luff back into place. All the while I was useless at the top of the mast where I had control of the halyards that separated the track. W/ found a piece of wood to tap with so he would not distort the wire and eventually they lowered me so I could help. Once back in place we rolled the sail back up correctly and congratulated ourselves on a job well done. Back to one issue. That afternoon I tooled down to the S end of the harbor and met Eric on Maritea. He’s a French sailing expat who bought a place here and he with his family use this now as a cruising base. He invited us to use his spare mooring if we wanted and when Windance III leaves we’ll most likely move down and share some cruising stories with he and his family. Till then, I’m off working on solving the engine surging again and we’re hanging with Werner and Kristina before they disappear East to Apitake for hauling the boat and doing a family filled event back in S. Africa over the holidays.